A porter is a dark brown, sometimes black, beer that is brewed from malt and is partly “charred” or “browned”. 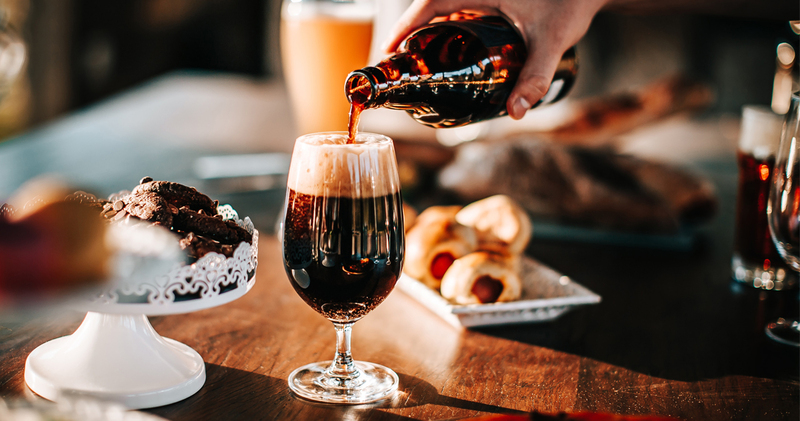 Porters were first brewed in the late 17th century and the “birth” of this beer style is still known as one of the most significant brewing matter in the past 300 years. Porter was the first beer style to gain popularity during the Industrial Revolution in England. The name “porter” was adopted for the beer because of the beer’s wide popularity with the porters who carried goods around the cities. Porters were George Washington’s favourite style of beer. A baltic porter is an English-style porter that blurs the line between porters and stouts even more. A baltic porter has ben fortified with a higher alcohol content to survive the journey across the Baltic Sea. What is a Brown Porter? Brown porters are more malty than hoppy. Flavours like bittersweet chocolate, toffee, and caramel are almost always present in a brown porter. Usually there are no significant roasted barley. Brown porters are said to be a “heftier” brown ale. What is a Robust Porter? As the name suggest, a robust porter is a “more intense” style porter. Robust porters are closer in style to stouts because of the use of roasted and black patent malt. The porter beer style was first brewed in England. Porters usually pour an opaque brown, although, sometimes are black. Brown porters tend to be slightly lighter in colour, pouring a medium brown. Porter Flavour: What does a porter taste like? Sometimes, porters can be described as “acidic” or “dry”. Porters can also be described as “sweet” and “moderately bitter”. Porters can be hoppy or not, this is up to the brewer. In porters, there can be rich notes of chocolate, coffee and sometimes smokiness. Toasted malt aromas are almost always present while there is usually little to no hop aroma. Porters can be anywhere from light to full and heavy bodied. What foods pair well with a Porter? Porters taste great with smoked foods. Think anything barbecued like sausages, stews, bacon, smoked brisket, and braised dishes. Dark, heavy porters also pair well with mellow blue cheeses. For dessert, pair your porter with chocolate cake. Porters should be served at a temperature between 45–50°F (7–10°C) in a pint (tumbler) glass. For a fancier occasion, porters can be poured into goblet glasses. Baltic porters should be served slightly warmer than regular porters. In previous articles, we examined what properties make the different beer varieties. In the next part of this series, we will explore the ingredients of beer; what exactly they are, and how they determine the various characteristics that define the distinct beer styles.